Now celebrating its 50th year, Horizons at New Canaan Country School received a $22,000 grant from the Fairfield County Community Foundation. 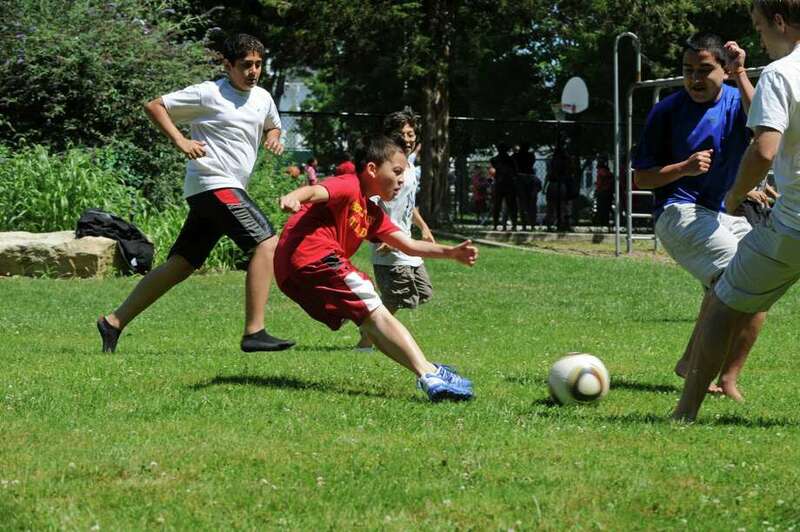 Above, students enjoy a soccer game at Horizons. When she joined Horizons three years ago, Abigail was painfully shy and had a hard time connecting with her classmates. After just a few weeks, she had made lots of friends. By her second summer, she was leading tours of the program. Thanks to a $22,000 grant from the Fairfield County Community Foundation, Abigail and 265 other children from local low-income families are looking forward to another summer of learning, fun and friendship. Now celebrating its 50th year, Horizons at New Canaan Country School provides an enriching summer experience to kindergarten through grade eight students from Stamford, Norwalk and other surrounding communities. Horizons offers students the opportunity to develop their academic skills through project-based activities, such as rocket building and filmmaking. Horizons complements the academic components of its summer program with a broad range of enrichment opportunities -- from swimming, wood shop, studio art and drama to weekly field trips and several overnight camp-outs. Connecticut has the widest gap in the nation between the academic performance of students from low-income families and their wealthier peers. Many researchers focusing on this crisis have reached a similar conclusion: after-school and summer experiences for children from low-income families are needed to help narrow the achievement gap. In order to be most effective, such programs should include not only academic remediation, but also organized athletics, dance, drama, museum visits, recreational reading and other activities that enhance inquisitiveness, creativity, self-discipline and organizational skills. Horizons students all graduate from high school, and 96 percent of them go to college. "We are thrilled with our results in this area, especially because two-thirds of the students we serve are functioning below grade level when they are admitted to Horizons," said Leah Kimmet, executive director. The Fairfield County Community Foundation promotes the growth of community and regional philanthropy to improve the quality of life throughout Fairfield County. Individuals, families, corporations and organizations can establish charitable funds and contribute to existing funds. The foundation has awarded more than $151 million in grants to nonprofits in Fairfield County and beyond. For details, visit www.fccfoundation.org or www.horizonskids.org.